Sorted sees 5 people baptised and 1 renewal on Sunday 3rd February 2019. 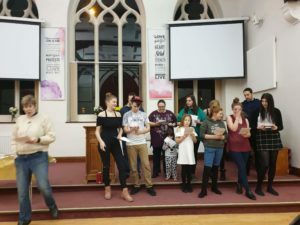 Sorted’s worshipping community is growing in faith as 3 adults, 2 young people and 1 older child say their baptism vows in front of the gathering of 40+ people at their latest baptism service. Another said: “I’m looking forward to being confirmed next month with +Toby. A Confirmation Service is planned for 3rd March 2019, with 9 candidates. The service will be held in United Reformed Family Church, Livingstone Road, Wrose. Please pray for an amazing outpouring of God’s Spirit as the candidates step out in faith and continue to walk in their beliefs.